I received this award from a very special friend, Janet at Dolly's Daily Diary I am grateful and blessed that our paths have crossed. Thank you! "A friend is a person with whom I may be sincere. Before him / her I may think aloud." BETH - "The most I can do for my friend is simply to be his friend. I have no wealth to bestow on him. If he knows that I am happy in loving him, he will want no other reward. Is not friendship divine in this?" MAITRI- "What is a friend? A single soul in two bodies." JANET- "Grief can take care of itself, but to get the full value of joy you must have somebody to divide it with." MEGAN"The world would be so lonely, in sunny hours or gray. 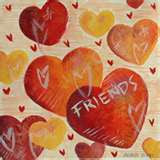 Without the gift of friendship, to help us every day." JENN-"One loyal friend is worth ten thousand relatives." HOLLY - "Friendship is love with wings." KHALED"I do not wish to treat friendships daintily, but with the roughest courage. When they are real, they are not glass threads or frost-work, but the solidest thing we know." DOUG -"When we seek to discover the best in others, we somehow bring out the best in ourselves." Thanks so much for the award Christine. I appreciate that you consider me a friend. I meant what I said before about your blog and your work and how inspirational your words and pictures are. I also got the meaning behind the quote posted and I will always remember it. You have all brought me unexpected moments of Happiness. Gratitude preserves old friendships, and procures new. Thank you for your drops of kindness! Many thanks for choosing my blog for your award. I commend you on your efforts in empowering women. It is women helping women that makes us stronger in the end. We sure should celebrate our friends because they are priceless. If you are curious as to why I said that read the article on my blog http://peacelovehapiness-eusebia.blogspot.com which is entitled, "I celebrate my friends, they are priceless." Thank you Dorothy for your valuable contribution. My Dearest Beth :)Love is but the discovery of ourselves in others, and the delight in the recognition. I am truly grateful and blessed to have you in my life!